From the Breviary according to the use of the Roman Curia, 1529, the conclusion of the sermon for the sixth day in the Octave of All Saints. In the mystery of today’s feast we must also venerate the blessed confessors, who being gifted with the dignity of the episcopacy or the priesthood, were most zealous in the worshipping God through the holy sacrifice. With Christ as their master, they steered the ship of the Church as it labored in the winds, waves and storms of heretics and false Christians. By the spiritual rod of their authority, they confounded the heretics, and drive out the dogs that barked and snarled. With the same pastoral staff, as with a hook, they drew to the Faith unbelievers, and those who wandered from the way of truth; they bore up the weak, and by they work and cultivation of the Lord’s field, urged on the tepid. With these are numbered also all the confessors who held a lesser order, or were not ordained, some of whom obedience to a (religious) rule approveth (for our veneration), while others were not kept back from the way of God by tumult of the world. In spirit they kept aloof like doves, and dwelt in desert places, serving the world only in respect to their body, but in justice and holiness, living as if they were in heaven. Triptych by Grifo di Tancredi, (Florentine actve 1271-1303) In the large central panel is a scene of the type known as a “Thebaid”, from the name of an Egyptian province that was once home to many of the original anchorites, i.e. “withdrawers”, men and women who withdrew entirely from the ordinary life of the world into desert and wild places to live a life wholly dedicated to God. - Above the central panel, Christ the Pantocrator and Angels. On the left wing: Angels descending from heaven; the Crucifixion; the women at the Tomb. 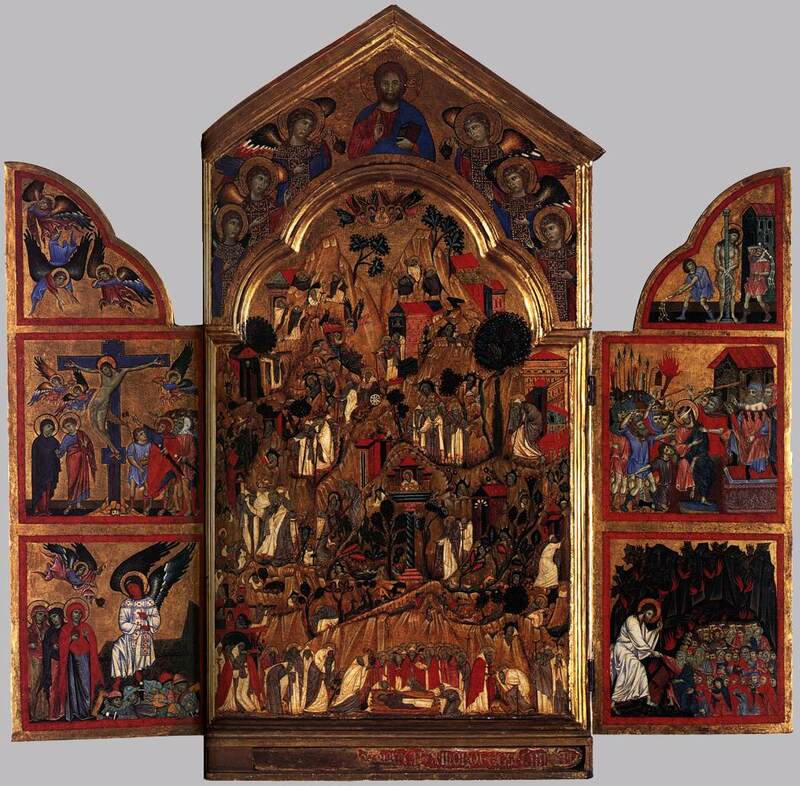 On the right wing: The Flagellation of Christ; the Mocking of Christ by the soldiers; the Harrowing of Hell.